Aren't they cute? Pictured are three of the thirty or so Japanese high school students that I help chauffeur around Utah for the next several weeks. I am having a blast taking them around Utah, seeing Cats and Tarzan (the musicals), Zion's Canyon, and river rafting in Moab. Unfortunately, I am not home very often and have little time or engergy for baking or cooking. 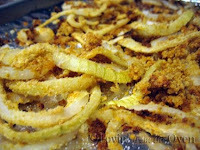 I have only recently learned to enjoy fried onions. 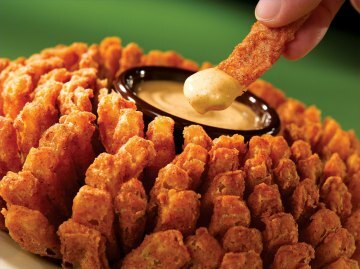 I was stuck in a long line at the Outback restaurant and they offered free Bloomin' Onions to those waiting. I was starving and was willing to give them a try. I've had my eye on Martha Stewart's Everyday Food Baked Onion Rings for some time. The flavor was so-so and I definitely missed the crunch of an all-around coating. Sorry, Martha... 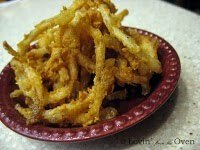 I will be sticking with PW's Onion Straws! Onion rings are one of my favorites, but I've never made them before. Delicious. Those bloomin' onions are to die for, aren't they?